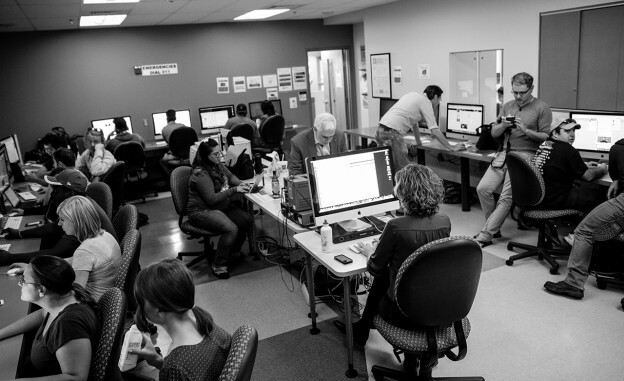 Students in an upper-level reporting class at the University of New Mexico held a Twitter town hall event in October. Photo by Aaron Anglin. As part of the work we are doing with the New Mexico News Port project at the University of New Mexico covering local elections, one of our goals is to provide a forum to engage readers — and particularly students — with politicians. Our news site was born this semester, and while it’s been populated with stories on all the local races, the site didn’t seem the best place for meaningful political dialogue. We wanted to host a debate that could connect people with the candidates. I felt that using social media as the conduit for the conversation would be familiar and comfortable to students who may not be well versed yet in politics and who might hesitate about in-person interaction with candidates. So as our student journalists set out to cover our elections for governor, U.S. House and U.S. Senate among others, I began to think about the best ways to provide that interaction. I focused first on high-profile races, but I figured that candidates including sitting Congress members might be too busy to come to campus for an event with students. But would they have an hour to interact from wherever they may be using something like Twitter? They might. So in partnership with News Port coordinator Michael Marcotte, we invited candidates to a debate during class times for two upper-level journalism courses. Our invites to the gubernatorial candidates were declined, but the candidates for the state’s First Congressional District here agreed to take part in a debate during one of our class times. Our Twitter town hall was born. The News Port promoted the Twitter town hall around campus and online in hopes of getting audience members to participate. Many of us have seen the #EdShift chats about journalism education, and I used those as a starting point for the format of the chat. I created an outline of what I had in mind and shared it with the students, not all of whom are Twitter rock stars yet. Still, I felt that using social media as the conduit for the conversation would be familiar and comfortable to students who may not be well versed yet in politics and who might hesitate about in-person interaction with candidates. We started by having students come up with questions for the candidates. Using Google docs, we shared and collectively refined them to be sure they were relevant to students. Many questions were solid and showed curiosity about meaty national topics. I only wish we had time to ask the candidates the suggested question about their most embarrassing moment in college. We divided the class into four teams for the event, each with a mission. The Twitter feed monitor team, for example, looked for the audience questions that we had been soliciting and monitored the hashtag we used for the debate. The team also made sure to look for answers or questions from candidates and audience members who forgot the hashtag. Another team worked as fact checkers. Each time a candidate gave an answer, this group scoped it out and provided information to support or rebut what the candidate was saying. This worked well to get students thinking critically about political speech. A third group worked on follow up questions for candidates. They had to be nimble and compose them quickly to keep the up the pace of the debate. Our last team curated the event using Storify (see the whole thing embedded at the bottom). 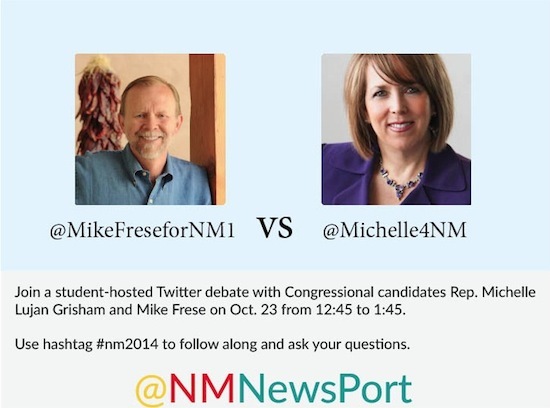 I ran our @NMNewsPort Twitter account, through which we asked all questions. In the future, I think a student with Twitter experience should give it a try. 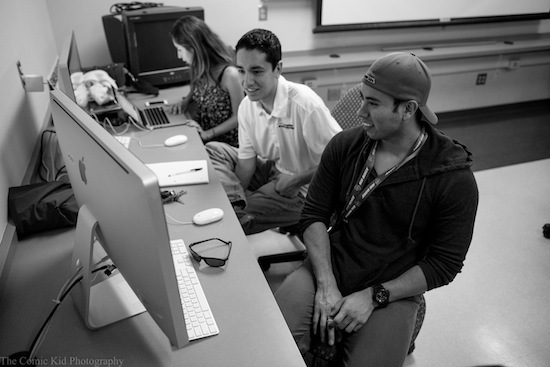 University of New Mexico students Robert Salas, Dominic Aragon and Isabel Gonzalez served on a team that created follow up questions for the Twitter chat. Photo by Aaron Anglin. As for the ground rules of the debate, we had to outline those pretty clearly. For starters, we asked that candidates tweet a photo of themselves at their computers, so we could be sure there we weren’t actually chatting with some astute interns instead of the candidates. Some students, too, were new to Twitter, and the leader of the curation team worked to bring them up to speed. Those students made this curation of the event. Speaking of speed, the worry I had that we wouldn’t have enough questions to ask was for naught. We only made it through four questions before our hour was up. The flow of the conversation, especially during candidate opening statements, was bulky. Because we had allowed three tweets per answer, we were kept waiting to see if the candidate was done “talking” and more than once I interrupted the congresswoman, who wasn’t done with her response. We also allowed rebuttals, which further lengthened the time spent on each question. On other occasions, the answers just took a while to come. In those pauses, we prodded the audience to tweet us their questions, but the delays felt pronounced. We didn’t have the spirited back and forth of a conversation in the way a traditional debate may have, but again, this wasn’t that traditional debate. To gain exposure for our event, we had a student from another class cover the event for the News Port, while another wrote about it for the student newspaper. Student feedback included suggestions that perhaps we create our own hashtag (we co-opted the widely used #nm2014 tag used for statewide elections) and that candidates should be better primed ahead of time to quickly move through their opening comments and then be given a time limit to reply or rebut. I would try this assignment again for sure, perhaps to hold a chat with the candidates who were elected, so students can ask them about their jobs. Kate Nash Cunningham is the editor of the New Mexico News Port. She spent almost 15 years as a newspaper reporter in New Mexico and now teaches at UNM and works as the writing coach for the independent newspaper on campus. She has a master’s degree in digital journalism and design from the University of South Florida and is interested in the intersection of journalism and technology.